Although radiators are reliable heating solutions, they can often have a negative visual impact in the room, particularly if we’re talking about a large heater. To tackle this issue, your best bet would be to opt for a capable radiator cover. Cabinets or modern covering solutions allow you to enjoy the heat without the unsightly look of the radiator unit. While purchasing pre-built radiator covers represents a decent idea, lots of people prefer crafting a more personalized cover to match the room’s aesthetic. Any DIY radiator cover project needs to use some high-quality materials and some of the most common are wood and metals. There’s a simple reason for this choice as these materials are decent heat conductors. In certain cases, you might prefer using softer materials such as fabric and string. Regardless of the material type used, it’s important to be careful when crafting your cover to keep a safe distance from the heater. Try to go for a distance of at least 4 to 6 inches because otherwise you risk creating issues with the air circulation. It’s important to prevent the cover from affecting the heating performance of the radiator. 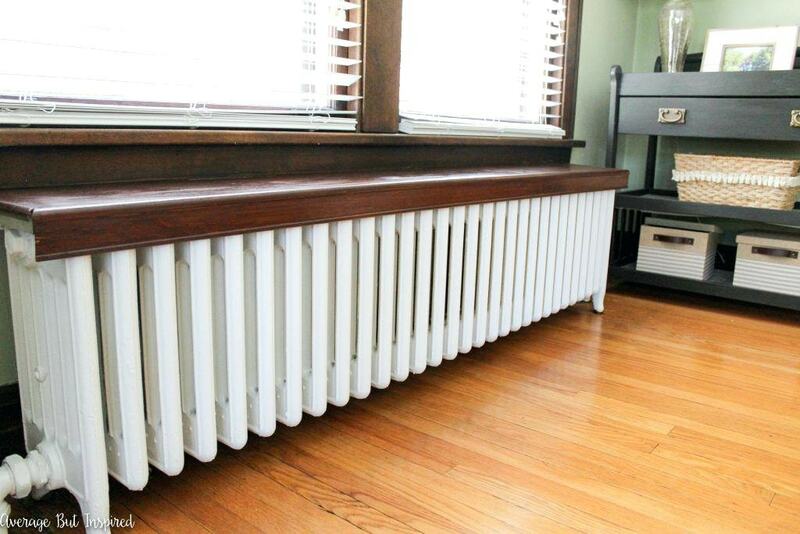 Aside from hiding the ugly look of your old heating unit, you can also use the cover in a more practical way. By adding a shelving area or drawers for storage, you should be able to make better use of the space occupied by the radiator. This idea works particularly good when you’re dealing with a small area. Accessorizing contributes to the concealment effect of the radiator cover. With the help of the right accessories, you can transform the basic area of the radiator making it more functional. While this spot is usually overlooked, you can raise its status even up to an elegant point of interest. 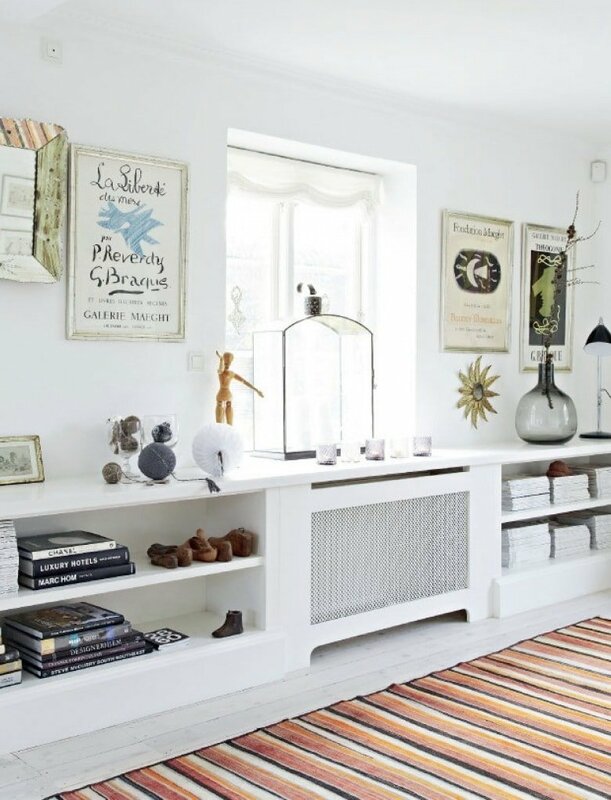 Beautiful wall art or a stylish mirror above are some good examples of accessories that will work nicely together with the storage area of the radiator cover. Covering up the radiator can give you a great opportunity to unleash your creativity. Lots of patterns and designs can be added to fit with the style of a modern home. Some of our favorites are decorative lattice-style patterns and gold metal sheeting. Using a cover for the radiator shouldn’t be seen as simply hiding the heating unit. You can add an interesting design element through the cover or radiator cabinet without sacrificing the airflow. Metal sheets can be found at home improvement stores in various designs and patterns. Once you find a satisfying one, you can further customize it by painting it in a suitable color. If you wish to take a radiator covering to the next level, you should strongly consider a cabinet. With some help from a professional, you can turn the old radiator into something that resembles a furniture piece very closely. The idea is to integrate the unit in a cabinet and make it seem as if it’s built in. By designing a cabinet cover for the radiator you can make smarter use of the available space and better integrate the unsightly unit into your home. 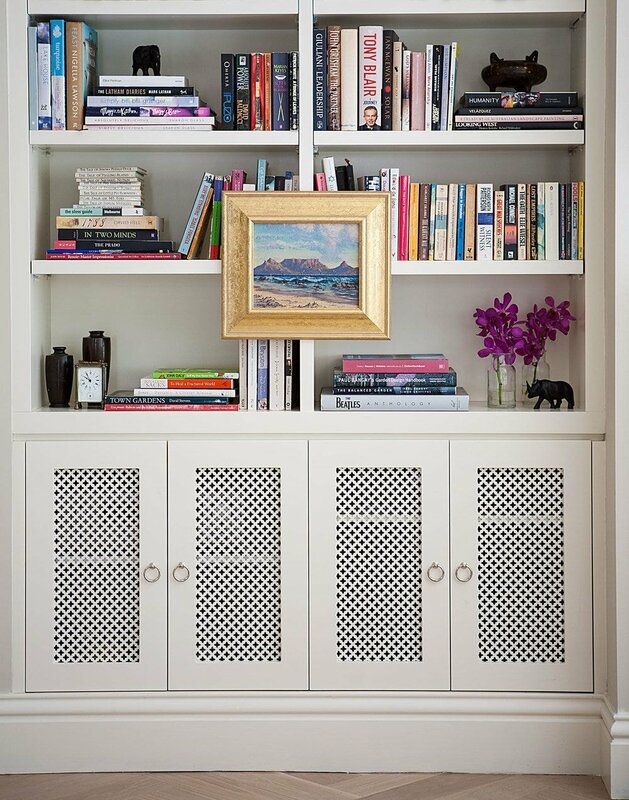 Those who are into minimalism will appreciate a radiator cabinet that also keeps hidden shelving and enables the heat to flow from the top. 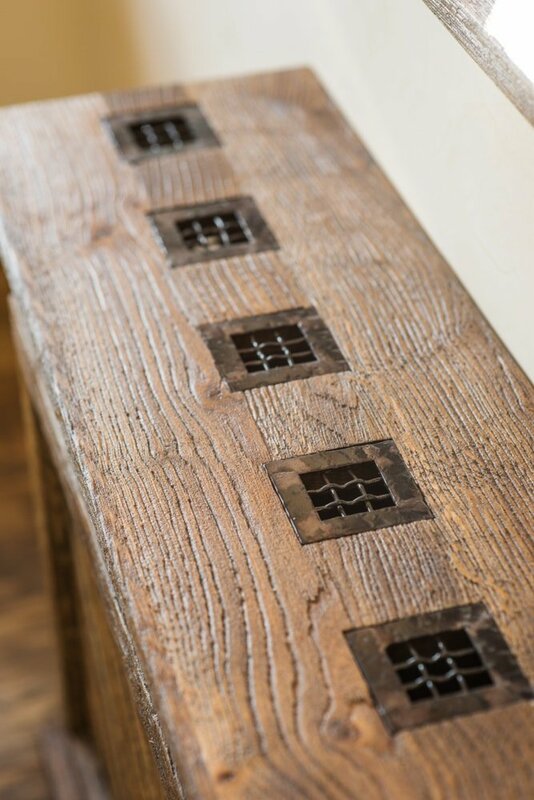 A wood radiator cover can be easily incorporated in homes where this material dominates. By combining it with other wood elements, you can enjoy a more harmonious look enabling the space to flow more easily. 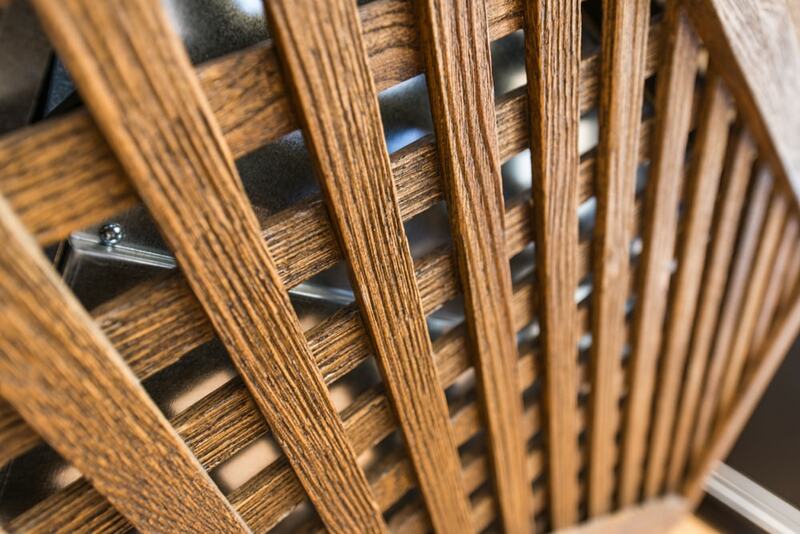 Wood can be used to craft a Mid-Century design for a heater cabinet if you prefer to blend old and new styles. The advantage of using wood as a material for your radiator cover is that it also adds a warming effect to the room. It’s a great match to serve as a cover for your heating unit and its versatile look allows you to add a natural touch everywhere. 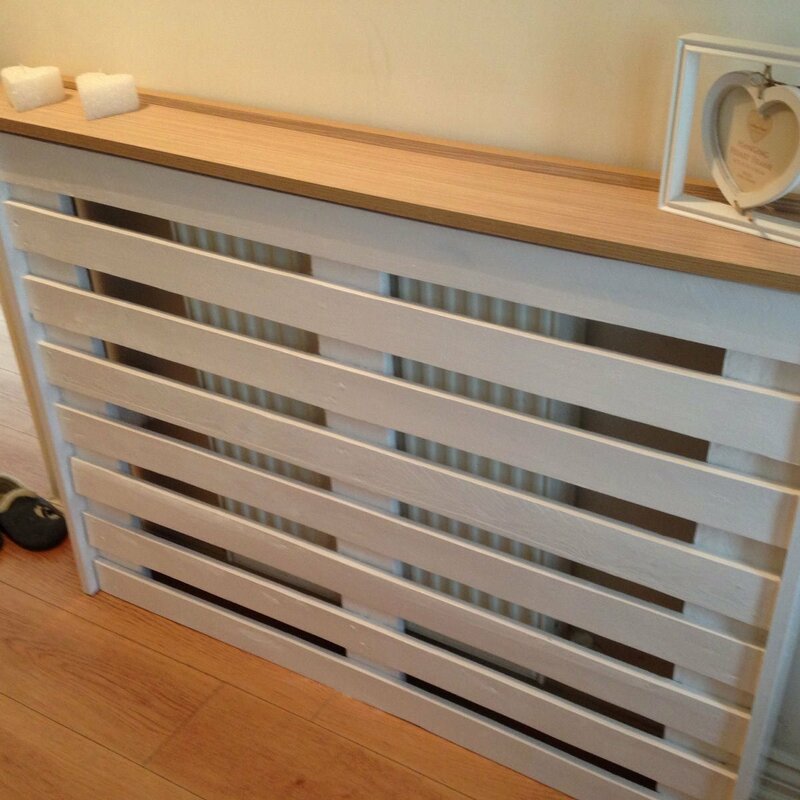 Make sure you go for a wood radiator cover that’s both attractive and functional. Radiators placed under the window can benefit from special treatment by designing a cover with a seat. 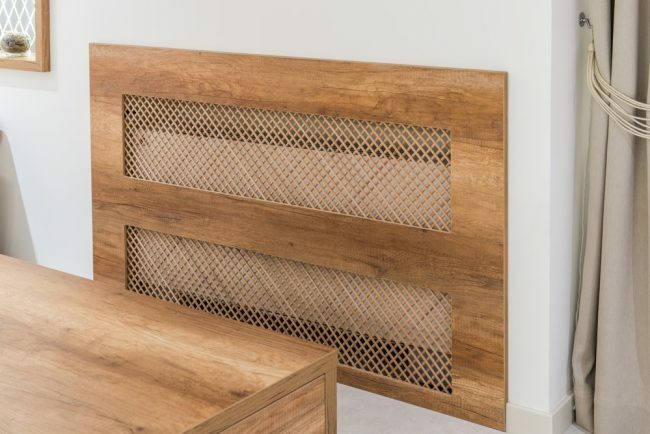 Being able to enjoy the warmth while relaxing on a bench sounds quite appealing and that’s why this is one idea for a radiator cover that you shouldn’t miss. You can also allow plants to get their daily dose of sunlight by placing them in a spacious area on the top. To pull off this look, it’s essential to leave enough ledge area on the cover to enable a person to sit comfortably. 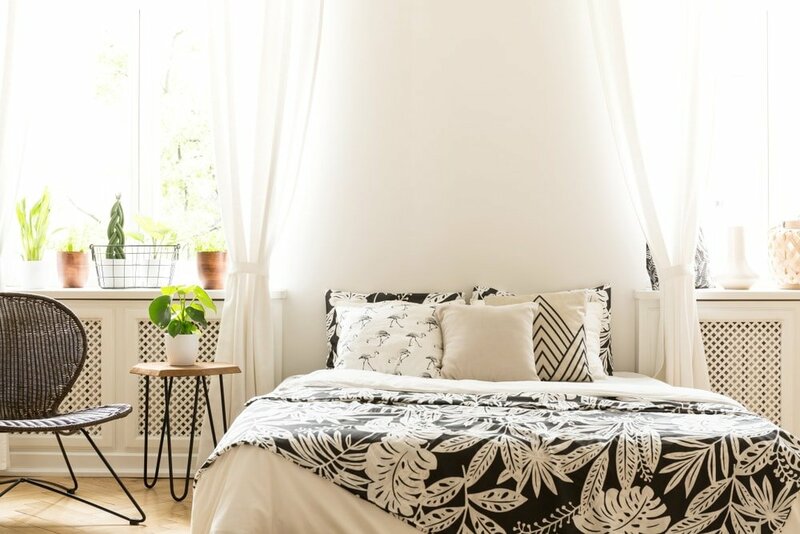 While having a window seat cover can be done in any room where there’s a radiator in the right place, it can be useful to prioritize certain rooms over others. For example, it might be a better idea to install this type of radiator cover in the kitchen where you can also enjoy coffee by the window or add a table near to eat breakfast. Those who own modern homes should probably stick to simple white radiator covers if they want a great solution for making the space surrounding the heating unit feel fresher than ever. 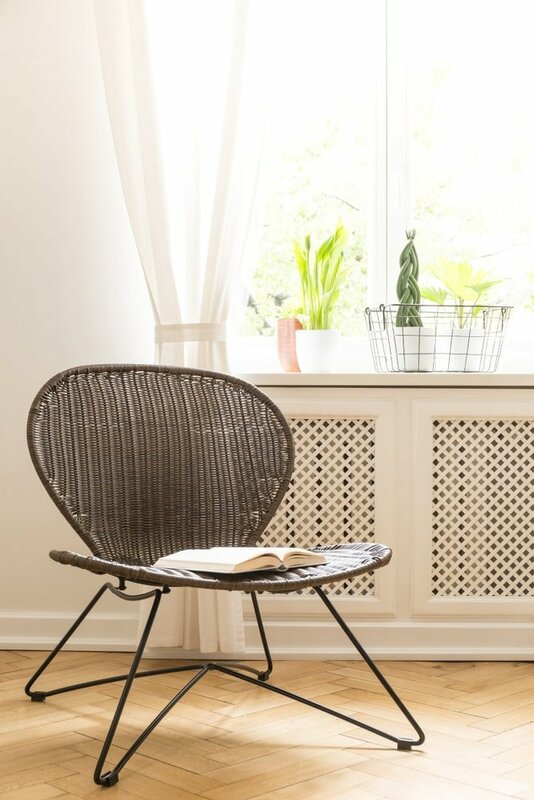 Your meditation corner can make use of a white radiator cover that can double as a small shelf for Zen-inspired decorations. White radiator covers work well for modernizing the baby’s room. This is also recommended if you’re worried about the hot unit being too close to the small child’s fingers. White is recommended as a color for the radiator cover primarily because of its neutral character which enables the unit to blend in with walls or other elements in the room. The bathroom can certainly make use of a cover to reclaim some of that space where the heating unit resides. 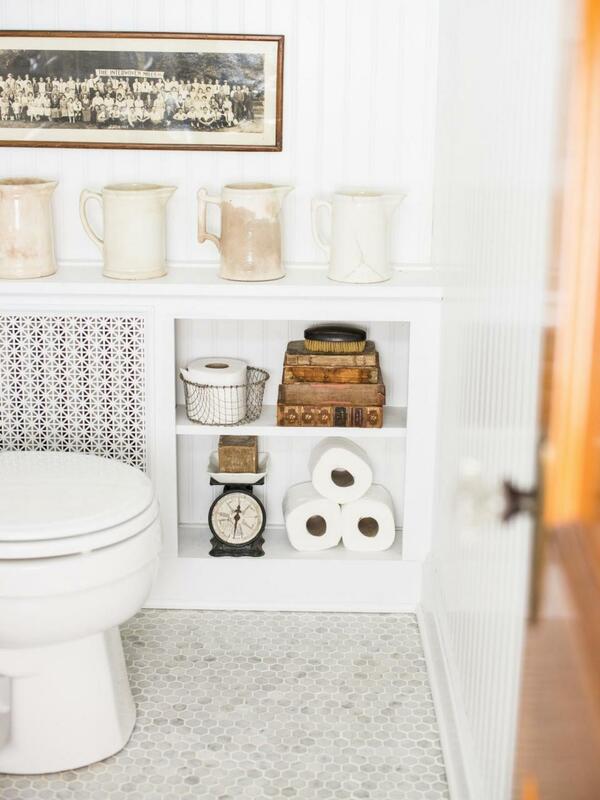 You can add some much-needed shelving when designing the cover to allow it to fulfill an extra purpose. It’s also better from an interior design perspective to eliminate any strange remaining gaps when installing the radiator cover. 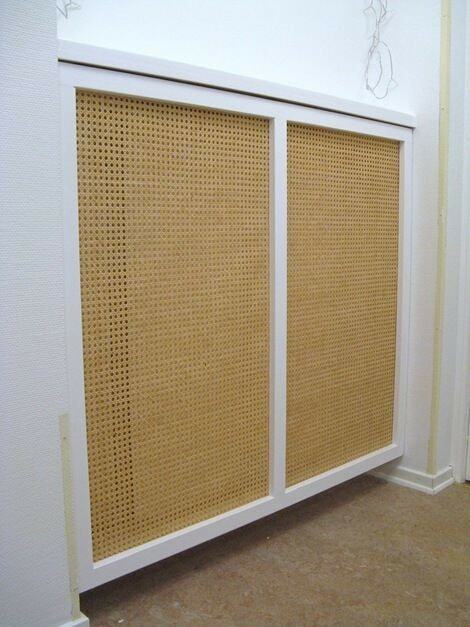 Cane webbing is a good alternative to more popular materials for covering up the radiator. It’s not only inexpensive but also efficient for this purpose considering how it enables the heat to pass through with ease. With the help of a cane webbing kit such as this one on Amazon, you can craft a stylish frame to conceal the heating unit. Sometimes you might need to take a closer look at your radiator and that would no longer be an option with most heater covers. To get over this disadvantage, you should try going for a radiator cover that offers doors to conveniently gain access to the unit inside. It could be useful to be able to check on the radiator’s dial and work on the knobs. If covering up the heating unit may seem like too much work, there are lots of attractive options that won’t break the bank. Another method that we like relies on natural pallet wood which can provide a rustic look with a minimal cost. Lots of ingenious DIY projects make use of this material thanks to its solid characteristics. Hiding the radiator is easy with the help of pallet wood as it offers a narrow profile which enables ideal air circulation. Some industrial areas are full of these pallets and you can ask around and obtain them for free. Just make sure they can be used indoors and aren’t dirty with chemicals or other substances that can create odors when the radiator heats up. 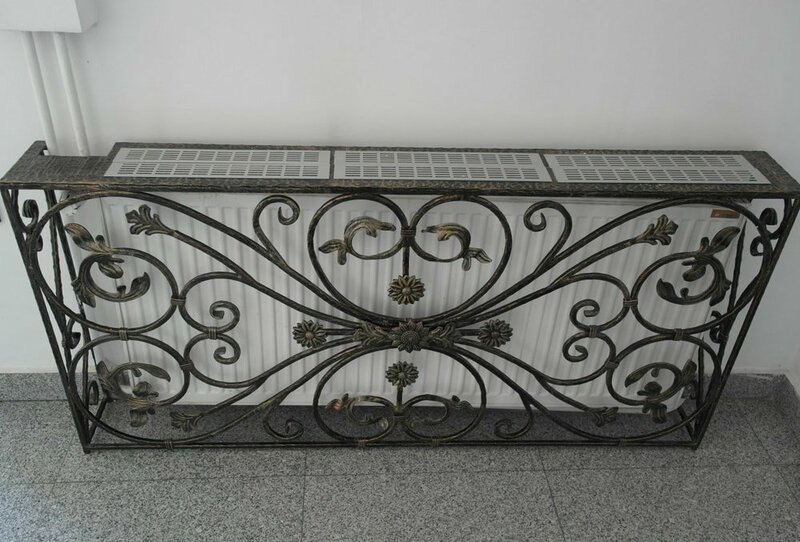 Some people prefer the industrial look of steel for their radiator covers. Getting this kind of custom project could be helpful in concealing an old heating unit and it can double as a bookshelf or an area to show off some decorations. 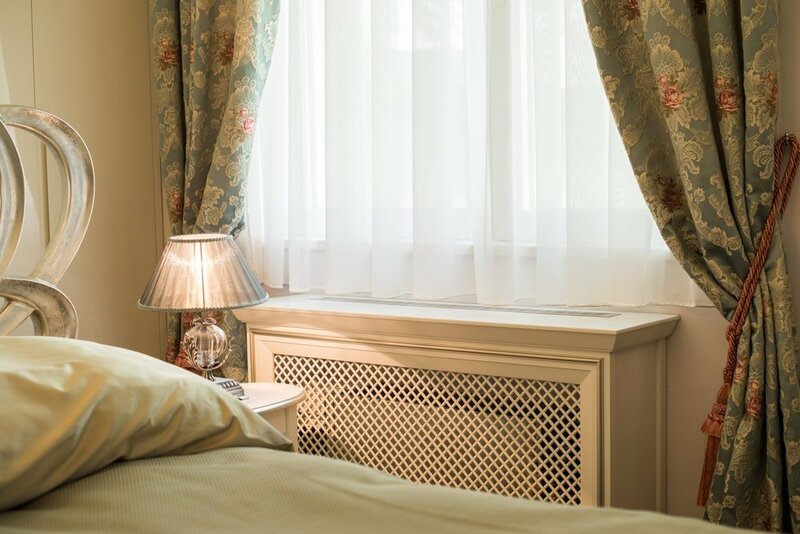 As long as you take into account the need to create a sufficiently large vent area, a steel radiator cover could be an ideal solution for your home. Many homeowners will find it too difficult to add a full-sized cover for their radiators. 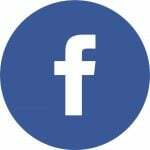 Concerns regarding heat effectiveness represent another problem that some people wish to avoid. There are other tricks you could try if you wish to draw less attention to an ugly home fixture like the radiator. 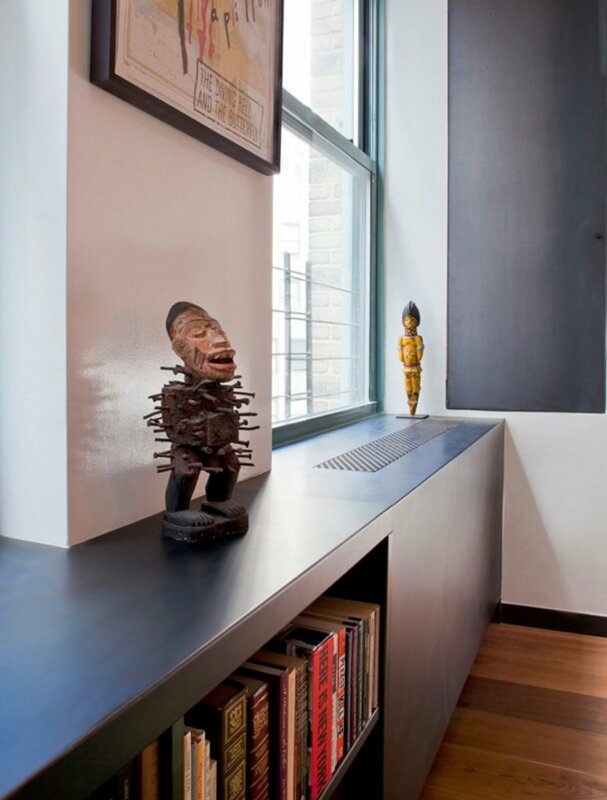 Minimalist shelving is the way to go when it comes to disguising a heating unit without risking heat airflow issues. This is a recommended solution to try if your radiator doesn’t really look that bad. A simple floating shelf could be ideal in this case as it offers decent storage space. Painting the radiator to add a bit of freshness to it represents another interesting choice for homeowners who aren’t willing to commit to a complete cabinet covering solution. Perhaps the radiator just needs an update to its look. There are two options here. Paint the unit in a very similar shade with the surrounding wall for effective blending in or you could try the opposite. Embrace the aesthetic of the heater and make it stand out using a contrasting pop of color. Make sure you go for high-heat spray paint to prevent the coating from cracking or peeling away when the radiator becomes hot. This spray paint from Amazon is a great pick. The painting method may not be as effective at concealing the unit compared to a cover, but it’s a simple and convenient solution if the radiator isn’t sticking out that much.